This white paper describes CentreStack which can be used by businesses to privately deploy and host a file sync and share solutions, with all the public cloud like features, while retaining full control of data storage and the related access infrastructure. Public cloud storage solutions have become increasingly convenient as they enable anywhere access to files and folders for web browsers, desktops and mobile devices, with sync and share capabilities. And we have seen companies like Dropbox and Box leading the charge to popularize these public cloud access methods. However, despite the convenience they provide, many enterprises (IBM, for instance) will not allow employees to use public services like Dropbox or Apple’s iCloud at work because they cannot tolerate the risk of trusting third-party cloud services to provide adequate security for their sensitive corporate data. The resulting challenge for large and small enterprises is to provide convenient access methods for corporate data while maintaining full control over the security of all data storage and data passage. Enterprises have traditionally relied on virtual private network (VPN) solutions to access corporate data, but they are difficult to use, as evidenced by employees’ demonstrated preference for public cloud solutions. Furthermore, with a VPN, you will need additional solutions to enable mobile access, web browser based access, sync & share, team collaboration functionalities. CentreStack provides a solution for the problem above by wrapping all the public Gladinet Cloud features into a Windows Installer (MSI) package that you can install on your own servers. CentreStack is pure software solution built on top of the Microsoft Web Platform, including IIS, ASP.NET and SQL Server (Standard/Express). It is fairly straight forward to prepare a Windows Server for the underlying platform or scale up to multiple servers. It is easy to setup and easy to do administrative work. Since CentreStack is a Windows Installer package, with a handful of clicks (Next), you can have the solution installed and ready in a matter of minutes. It is easy to get started. It is as easy to upgrade as well just by install it over existing installtion. CentreStack integrates tightly with your Active Directory domain. It also integrates tightly with your own storage, such as your own file server storage, your own OpenStack storage, EMC Atmos storage and etc. It is easy to plug in your existing user management and storage systems. It is recommended that CentreStack be installed on Windows 2008 R2 servers, or Windows 2012 R2 servers as shown in the following configuration. You will install the CentreStack inside a DMZ zone. It will have a public DNS name that client devices can use to connect. Below is a diagram for a CentreStack Cluster, when it has more than one server in the server farm. 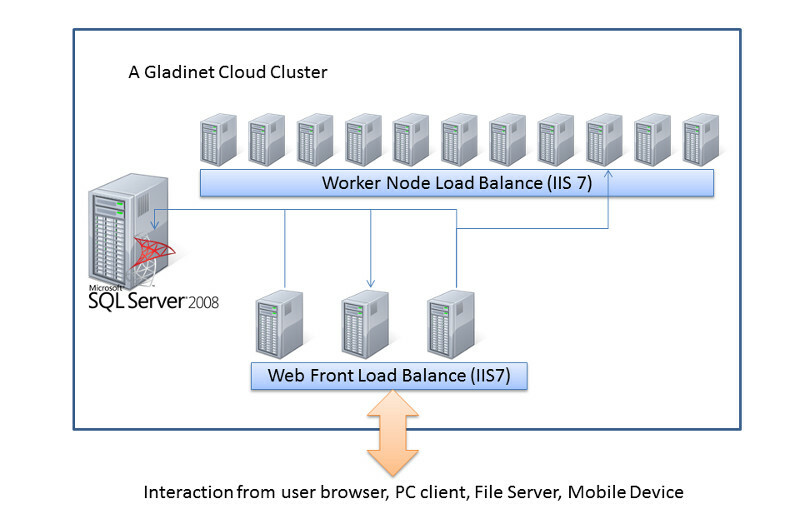 For detailed implementation and deployment information, please reference the Gladinet Cloud Enterprise Deployment Guide. CentreStack leverages both the feature set of the public cloud and the private enterprise solution packaging to create a self-hosted, installable file sync and share solution. The end result is a solution that Enterprises can easily deploy for their own storage, with deep Active Directory integration. Once you fill out the form, we will send the product download link to your business email address.